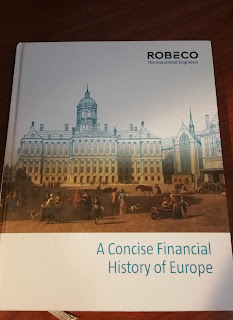 If you like finance and history, you'll love Robeco's "A Concise Financial History of Europe," written by Jan Sytze Mosselaar A lot of financial firms provide books to clients, and I bet if you visit Robeco in Rotterdam they'll give you one for your plane ride home, which is more than enough time to read it (100 pages, lots of pictures). It starts with Fibonacci introducing the Arabic number system in 1202, but interestingly the Florentine bankers prevented anything but Roman numerals as of 1299, and the Medici's didn't adopt Arabic numerals until 1500. Jan notes the rise of finance from Northern Italy, to Bruges, then Antwerp (1500-1550), and then Amsterdam. As the Dutch East India company was the first traded stock (1602) and prospered throughout the 17th century, Amsterdam was well situated. Amsterdam also reduced the uncertainty caused by the many coins and their various levels of debasement by requiring every transaction above 600 guilders to go through the Bank of Amsterdam, which kept a 100% reserve ratio and cleaned up the system by melting down 'bad' coins. The English are fond of deprecating the Dutch--Dutch Uncle, courage, date--but they really owe the Dutch quite a bit. The financial center of Amsterdam literally moved to London around 1680, as when Dutch stadtholder William of Orange took over England via the Glorious Revolution in 1688, it gave them not only a Bill of Rights that limited monarchical power, it also created the Bank of England, tradable bonds, and an active London stock market. The start of the Industrial Revolution is often dated around 1750 centered in London, and surely it would have taken a lot longer without those innovations. There was a simple way to get around the Catholic prohibition on interest. The 14th-century Florentine bankers simply used different FX rates on contracts. As FX rates could fluctuate the bill was not considered a loan and so not usury. Explicit loans were also available, but they would have been more like 'payday' lending today, a business dominated by two outsider groups: Jews who could charge interest to non-Jews, and pawnbrokers nicknamed Lombards, whose name underlies the 'Lombard Streets' found in many financial districts. Jan mentions several market crashes I had never heard of. The crash of 1340 was perhaps the first international financial crisis, affected by the English default at the outbreak of the 100 years war. An IPO bubble crashed in 1696, destroying 70% of the 140 companies traded in London. Then there's 1720, where the Mississippi Company saw its share price rise 20-fold only to end worthless, and in that year only 4 of the 190 new companies survived. The massive destruction in these early stock markets gives me hope in that I suspect that at least 70% of the new bitcoins and tokens are worthless, but as these prior crashes show, that level of worthlessness does not imply the worthlessness of the blockchains in general. Other crashes mentioned occurred in 1763, 1772, and 1825. If you ever go to a Robeco presentation, be sure to hit them up for this book.